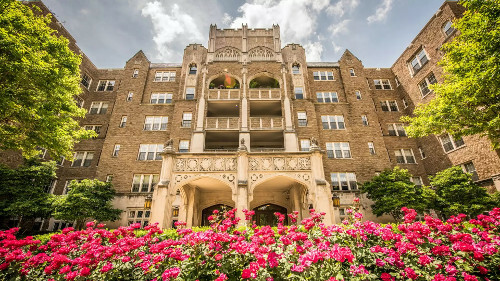 Originally constructed in 1929, Alban Towers Apartments is a remarkable community with an incredible history. Recognized by the National Historic Register, Alban Towers served as the D.C. campaign headquarters for JFK and its luxurious suites were frequented by celebrities such as Frank Sinatra. Coupled with its Gothic Revival architecture and Tudor interiors, every moment here is an experience. Even with its historic status, these homes today feature thoroughly modern upgrades such as central air conditioning, full size washers and dryers, gas fireplaces and hardwood floors. Lavish amenities include a rooftop sundeck with panoramic views of Washington, DC, and an indoor lap pool available year round, 24 hour fitness facility and concierge service. Visit the many local destinations, admire the magnificent views and be treated to the awe-inspiring experience here at Alban Towers Apartments.